Works with all the VVDI tools including VVDI2 Mini Remote Programmer, VVDI Key Tool etc. Notice:Only work with English VVDI Key Tool,and newer version VVDI2. XHORSE VVDI Key tool Volkswagen B5 Style Universal Remote Key 3 Buttons comes with quality guarantee for all have passed quality control before delivery. And it is compatible with all the VVDI tools including VVDI2 Mini Remote Programmer, VVDI Key Tool etc.). By using Xhorse Remote Key, you can accumulate member points which can be used to exchange VVDI 2 part special functions and accessories. 1.How to distinguish Xhorse Wireless remote key and Wire remote key? 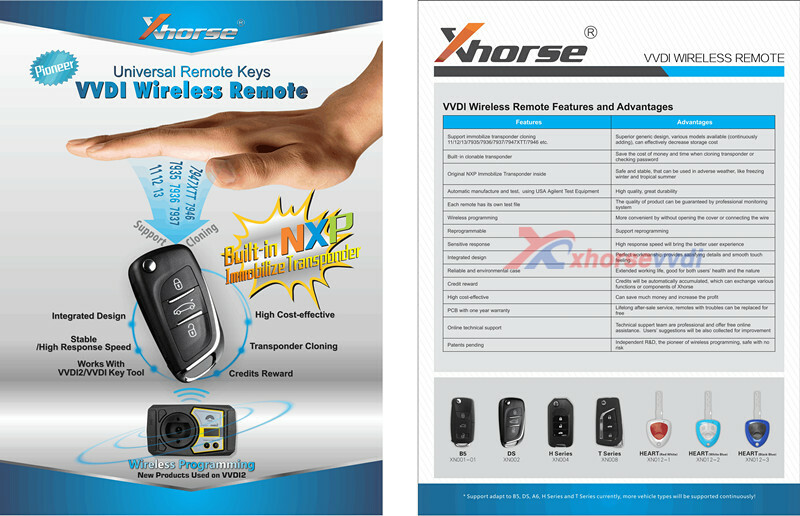 Xhorse wireless remote key is with NXP chip. NXP chip is immo chip,like 46/4D chip.If you use wireless key,it is already with IMMO chip,can generate new key directly.But if wire one,you need to add a immo chip like 46 chip into wire key,then can use normally to start car. XN one is wireless remote,X one is wire remote. Use VVDI Key Tool programming cable connect with key. Use VVDI2 remote programmer cable,connect with wire key and VVDI2. Wireless remote can collect 40 points each key,Wire remote 25 points.